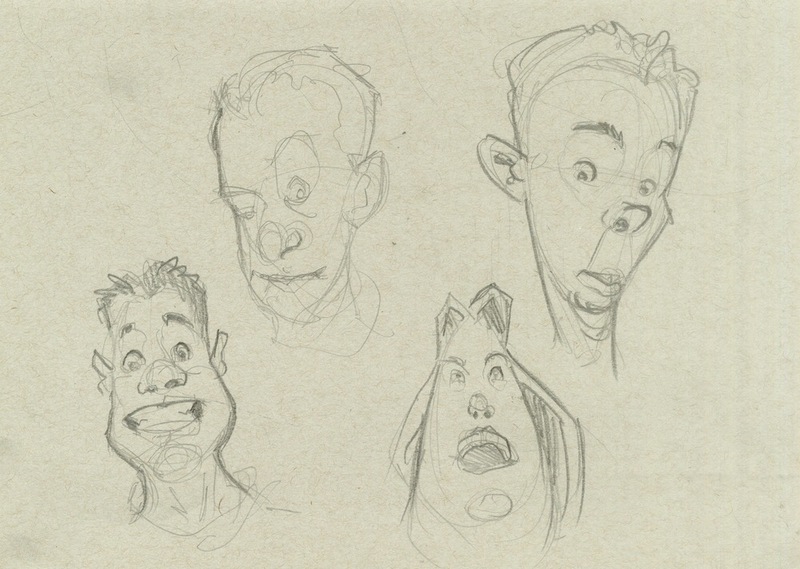 Here are some more figure drawings for you. Cheers. We have this thing at school called the Illustration Student Collective (ISC) where we meet up and do things together to further enhance the brother, and sister, -hoodness amongst us illustrators. Sometimes we do homework, other times we have a visiting artist. 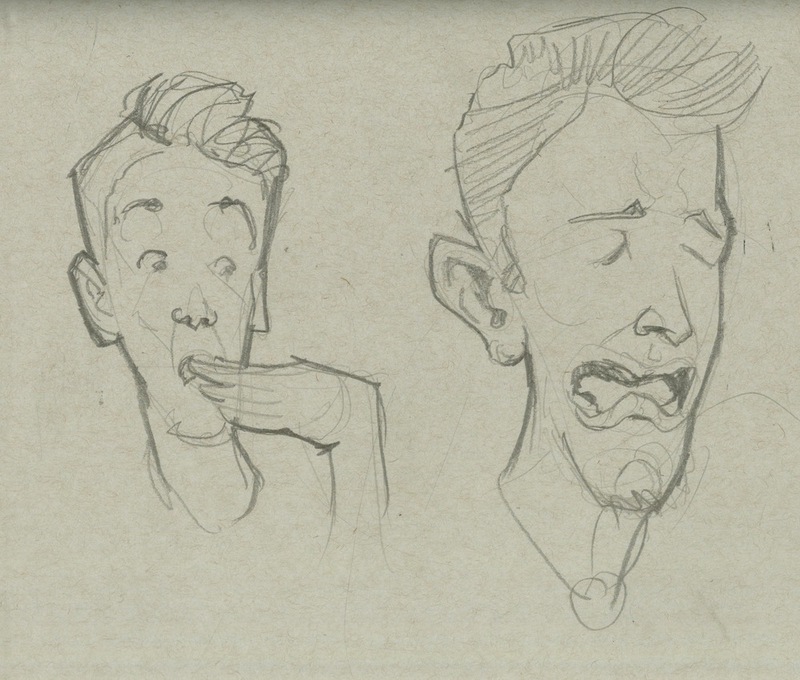 This time we did caricature gestures of ourselves. It had a great laugh, slappin’ our knees and perhaps even wipin’ away a giddy tear. This was an in class assignment we had to do. The goal was to describe a weird word and illustrate it. We could use whatever medium, but it had to be done in a couple of hours. It's okay, but I think I can pull it off better next time. I hope... Stay tuned for more updates on my comic soon. Could the title be revealed? Maybe. Who knows? Here's more of the same. I do have more drawings than this, like another character done, but I have not been able to scan them yet, so this is what I've got. I'm feeling that the little one on the right is more to my liking. I want it to be an adventurous comic, so I feel it needs to not be too realistically drawn for it to get the right feel that I want. I am playing around some more. This time a sketch I colored. I think that my comic possibly might benefit from a more vintage look, so I'm trying different things to achieve that. This is one of them. Here’s another update for my sci fi story. 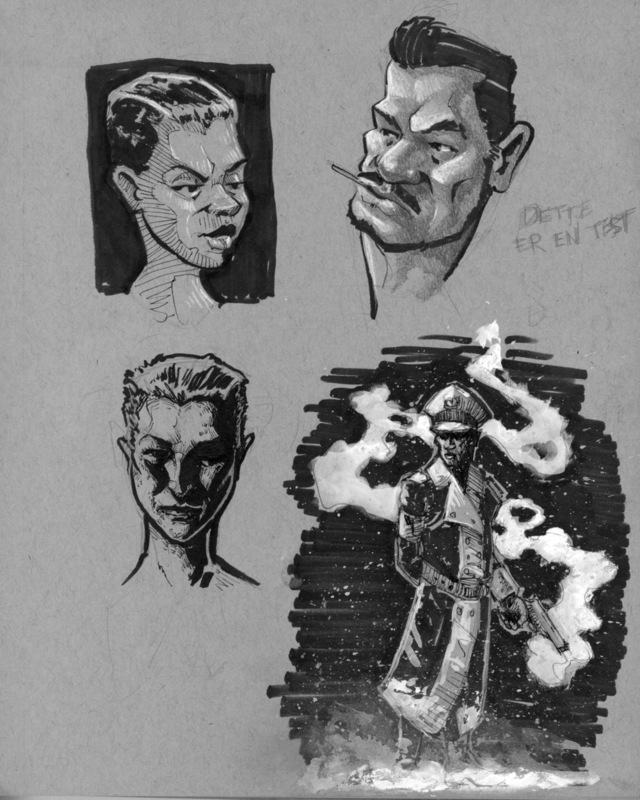 Now with another character profile and some ink tests. School is back in business, so it's time to share some of the first week worth of work. Here’s a portrait of Rolv Wesenlund in his signature character, the always bickering, annoying, self centered and general wise guy Marve Fleksnes. Wesenlund passed away last week, so I thought a little portrait of him was in order. And click here for a clip where Marve is a radio amateur, stumbling over a danish sailor in distress and his archaic danish number system. Remember to put on english subtitles. 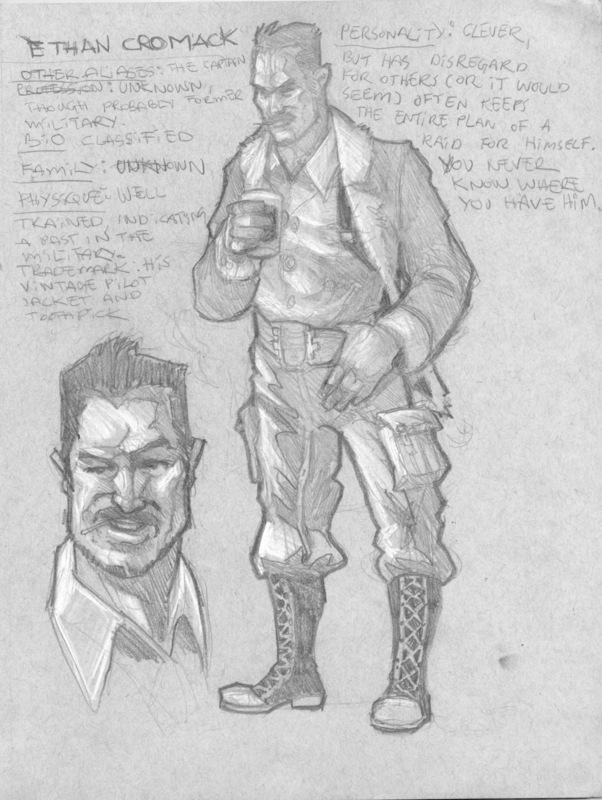 This is an updated version of the character found in my "Snake Chase" piece. More info on the universe she is a part of will come later when more stuff materializes. I keep the cards close to my chest, but I can say that inspiration from Firefly, Indiana Jones, Star Wars and so on and so forth. 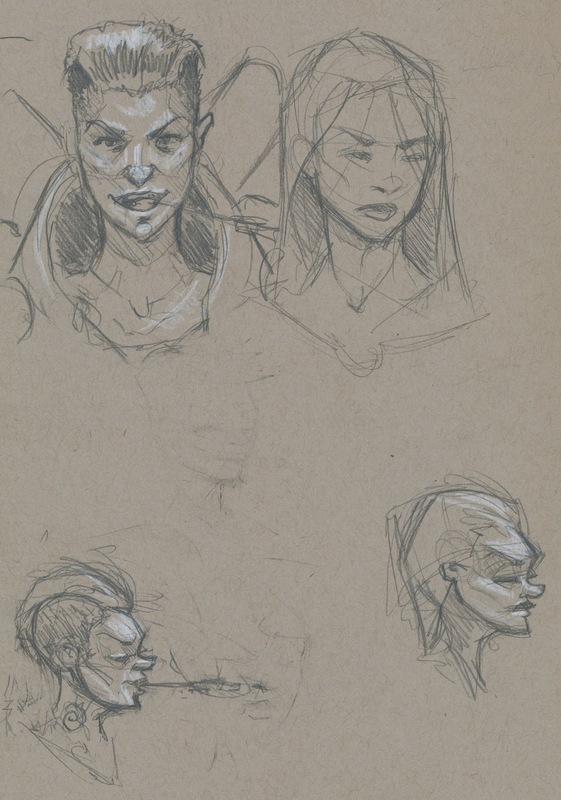 I can say that the lady is a bounty hunter and is called Hazel Grimley (for now, at least). Okay, so I was off to a sudden visit to hospital to see my mom today, so I have only these sketches of a character I’m working on for a project. More on that in the future. Near or far future I don’t know. In a few hours I’m off to witness yet another performance of The Wall by Roger Waters. I saw it in Columbus a few years back, but now I get to see it on my own home turf. I am quite excited. How excited you say? Well, excited enough to throw together this quick sketch. Here’s the piece I teased about last post. Enjoy. One of the versions is perhaps more revealing, whereas the other is for those who feel lactose intolerant. Today I took deep dive into my archives and salvaged this oldie I had. I’m posting it as a teaser to my next big piece which will be in the same vein as this one. Here’s a japanese zen ink landscape-ish painting of the view from the ascent up Galdhøpiggen, Norway’s and Northern Europe’s highest peak at 2469 meters above sea level. A quite epic hike, that involved crossing a glacier and climbing a really steep ridge. There was also a cafeteria at the top as well and since it was at Norway’s highest point, their products were priced accordingly. Hi, I’ve got a website now thomaskirkeberg.com check it out. In other news, I drew a hand. We’re now into the second year of the Hobbit, so why not celebrate with another piece of fanart? The final part, finally. Maybe this one is harder, since I went more abstract. I was trying to do it really fast and try to use a variety of colors. Didn’t turn out too well, but hey better luck next time. ANSWER: Las Vegas. The most bling-bling place I have ever been. ‘Nuff said. A little late again, but a change of plans lead me to not be home yesterday. Anyways, here is part 6 of Where in the World Was I? Where can I have been this time? ANSWER: The Grand Canyon! Quite an awe inspiring place. I wish we could have stayed longer to do some rafting, hiking etc, but we could only do a jeep tour before it was off to the final destination of our trip. More on that later. Here we are again with the fifth edition of the riveting Where in the World Was I?-series. This time at the place where Forrest Gump run out of continent and decided to run all the way back again. ANSWER: It’s the end of Route 66: Santa Monica Pier in Santa Monica/Los Angeles.Venice beach was quite nice, but LA wasn’t all that exciting. I guess if you want to go shopping (LA is just one big store, appereantly since that was pretty much all the attractions), visit Universal Studios and Disney and/or be at the beach. Also, to my surprise, LA was not hard to drive in at all. I’ve heard a lot of horror stories but the truth was nowhere close. A lot of traffic, yes, but easy to navigate and many parts of the city had moderate amounts of traffic. Sunset Boulevard had little traffic at all, which was where our hotel was. Here’s another location. Can you guess where it is? It’s at the place Robin Williams calls God’s Etch n’Sketch. ANSWER: The Golden Gate Bridge in San Francisco. Probably my favourite place during this trip, at least what cities goes. Union Square wasn’t as nice as it should have been, concidering the high end shopping that was there, however the victorian areas, fisherman’s warf and the golden gate park were all wonderful places.